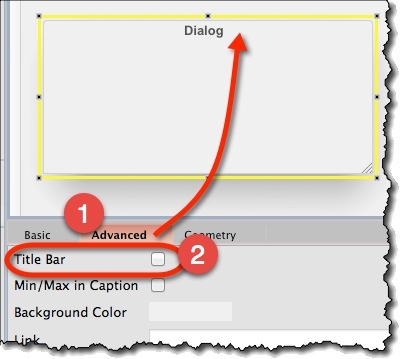 Select a dialog, and open its “Advanced” properties. Turn the title-bar on or off. Turn the Min/Max icons on or off. Caption (“Basic” tab) – Text that is displayed in the title-bar. Title Bar (“Advanced” tab) – Display title-bar or not. 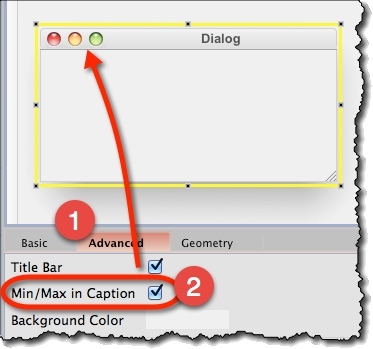 Min/Max in Caption (“Advanced” tab) – Whether to show Min and Max icons when the title-bar is turned on.